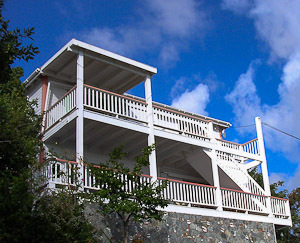 Coral Bay Outlook is a lovely, hillside villa overlooking one of St. John's most spectacular harbors. 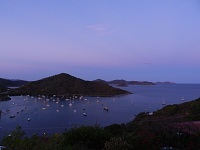 From the house there are extraordinary views of St John and the British Virgin Islands. 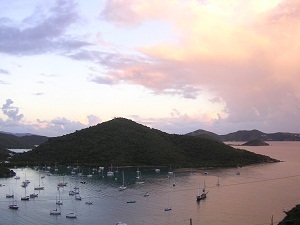 Just minutes away are many of best beaches and snorkeling in the Virgin Islands National Park - Salt Pond, Leinster, Maho and more. 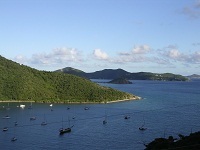 The Village of Coral Bay with restaurants and small shops is within walking distance. 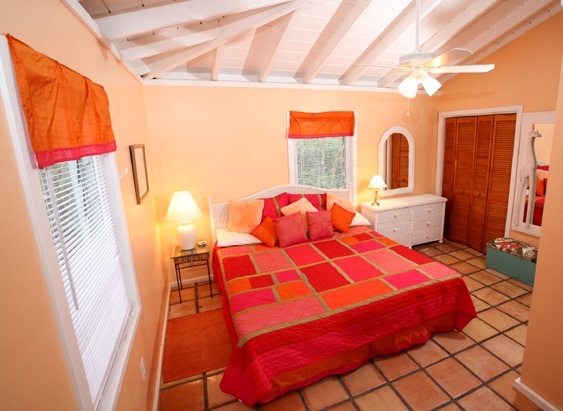 The villa has two floors - a main level with a large great room, gourmet kitchen and two large bedrooms. 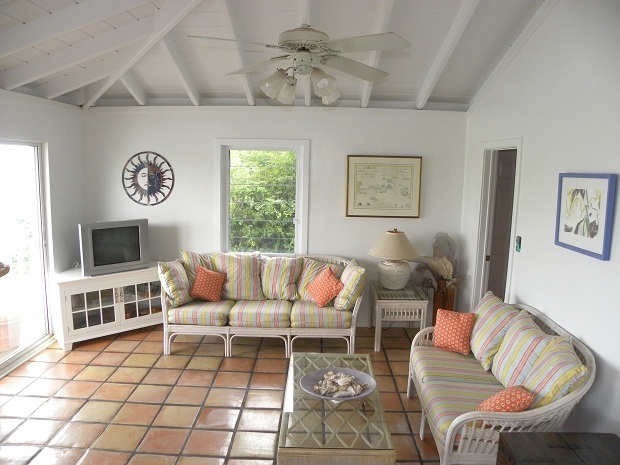 The garden level has its own separate entrance, another living room and kitchen, one bedroom and a full bath. 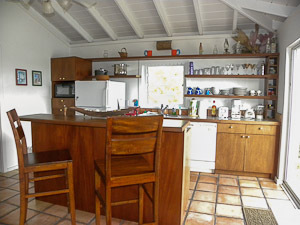 You may rent the entire house which sleeps 7 people and is perfect for two couples who want privacy or a family traveling with another couple or in-laws. Or you may rent the main level (upstairs) for up to 5 people or the very affordable guest apartment (garden level) which suits a couple. You will find the views are superb from all levels. The main level has a 'great room' with an outdoor deck and a Weber for outdoor grilling. The great room includes a living area with a TV, DVD and stereo, an eating area and a modern kitchen with dishwasher, stove and microwave. 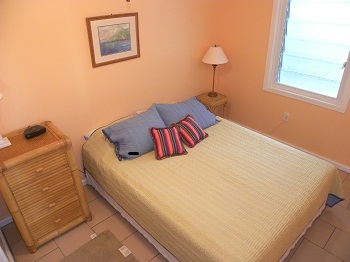 There are two large bedrooms - one with a king bed and the other with a double bed and a single bed. 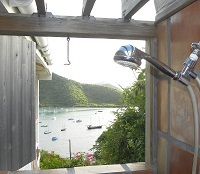 Both bedrooms have private baths with semi-outdoor, tiled showers with views. 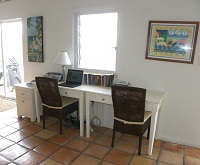 We have comfortably furnished our villa in natural rattan, dark woods and tile. 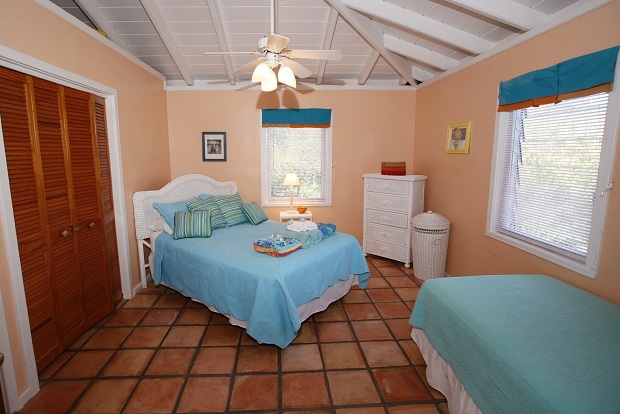 There are ceiling fans in every room and the house is situated to take full advantage of the tradewinds. Our place comes fully outfitted with linens, guidebooks, beach supplies and more -- everything you need for a carefree vacation. 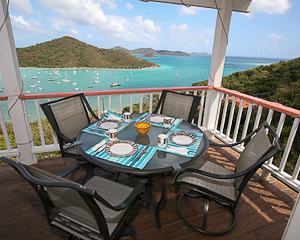 There is a completely equipped kitchen for gourmet cooking and a Weber gas grill for outdoor grilling on the deck. 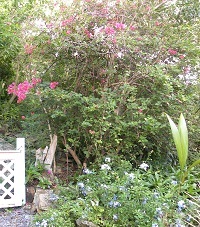 The garden level has its own entrance and large deck with panoramic views. 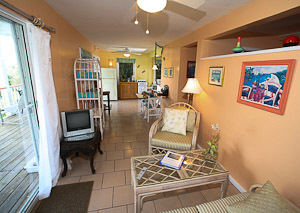 It has a living/dining area, a kitchen, 1 bedroom with a queen bed, and a full bath. 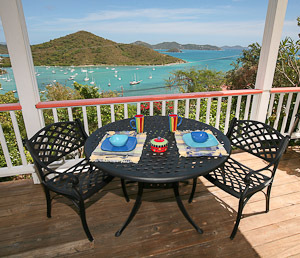 It is furnished in the same Caribbean rattan style, bright and colorful. The house is surrounded on three sides with gardens. 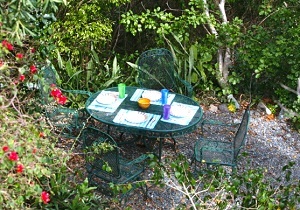 The garden level is a very affordable accommodation for two. 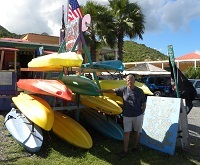 Right at the bottom of our hill Crabby's Water Sports where you can rent kayaks and snorkels and arrange for charters and other water based excursions. 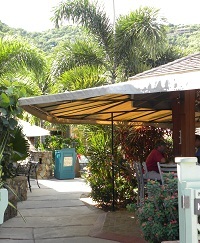 Coral Bay Outlook is just minutes from the village and good shopping and dining opportunities from excellent, fresh seafood to authentic Caribbean fare. There are many choice eating spots nearby.